At the end of The Nutmeg of Consolation, Dr. Maturin at last has an opportunity to see a living platypus (Ornithorhynchus anatinus, aver. wgt. 2.5-4 lbs. Aver. lgth. 2 ft.). The Doctor would have been studying in Paris when the first specimen of the platypus arrived in Europe. That was a female, so he was not aware that the male platypus has a poison spur on his heels. They are the only mammal that has the ability to produce poison, so his injury was totally unexpected. Platypuses are one of the two only living monotremes; the other is the echidna. Both are natives of Australia, but their lineage goes back in the fossil record over 100 million years. Monotremes lay eggs, unlike the rest of us mammals. They do share the rest of mammalian characteristics (hair, warm blood, production of milk, etc. ), so they are genuinely members of our class. They live an aquatic life, obvious from their webbed feet, in streams, feeding on worms and other invertebrates. The males used their poisoned spur to protect their territory and their family. 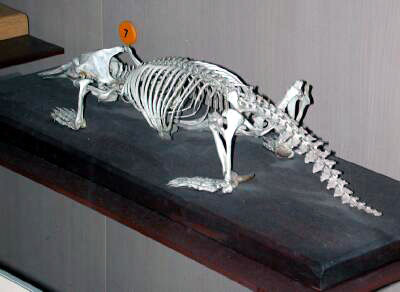 The Doctor never got to observe this next mammal in the wild, but did have one of its teeth.